Nailing more holes in the coffin of talentism and biological determininsm. That kind of thing is always welcome. Gets more into the internal neurological (cellular) details of becoming awesome than other books (which focus primarily on the external mechanics of the matter). This book can be summarized in one word: myelin(ation). It focuses on this one point and drives it home from many different angles. 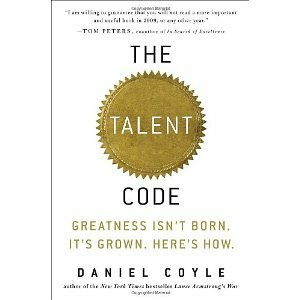 Where Colvin (Talent Is Overrated) mentions myelin only in passing, Coyle sets it front and center as more or less the Grand Unifying Theory of skill and so-called talent. Myelin is the root of all talent. That’s what Coyle is telling us. It’s beautiful, elegant and simple (but not simplistic) message. Coyle isn’t obsessed with pain the way Colvin was. He’s open to the idea of things being fun. Insofar as he values deep practice, he’s still on the same page as Colvin in all the right ways. But Colvin wants you to slog; Colvin is anti-automaticity. Coyle, on the other hand, is very much open to fun and unconsciously developed awesomeness (as is the case with futsal). The automaticity thing could just be poor choice of words on Colvin’s part — of course deep practice entails a great deal of seeking out and plugging up errors, but the fact is that those errors get plugged precisely because the correct behavior becomes automatic. Occasional ageism. The last thing adults need is more excuses to not try. I am sick to far king death 😀 of this age crap. When I was a kid, the answer to anything was always always always “you’re too young, wait until you’re older”. Do not pull this bait and switch crap on me now. I’m here; I’m alive and I’m going to do stuff. End of story. Occasionally condescending explanations of science. Hello? Think of the audience here. I’m reading hardcover book! I’m pseudo-smart!…I don’t need the smiley youth camp coordinator tone! The text has that Time/Newsweek habit of acting as if: “we, and we alone have the answers, and we may have been slightly wrong before, but we’re right now and we’re here re-educating, you, the ignorant masses”. Yeah, basically, the text sometimes displays an annoying confluence of chattiness, condescension and (perhaps most potentially grating of all) a delightful unawareness of its own chatty condescension. Again…that Camp Counselor Effect. This book can be summarized in one word: myelin(ation). Before I talk about the cool parts of this book, let me talk about the goofy ones, just to be mean. “myelin doesn’t care about who you are. It only cares about what you do”. Replace “myelin” with “Japanese” and you have a one-line philsophy for language immersion right there: “Japanese doesn’t care about who you are. It only cares about what you do”. I have three letters for you: SRS. Three more words: overlapping cloze deletions. Coyle appears not to be familiar with SRS. But he uses cloze deletions in all but name as a reader exercise to explain the concept of deep practice. Everyone worked for their language ability once. It only seems like it came effortlessly after the fact. Believe that. >Everyone worked for their language ability once. It only seems like it came effortlessly after the fact. Believe that. Yep. After the new neurological links are created in our brain we can not understand very well those who are still working on the skill/ability. This is what makes great teachers/coaches so rare. They really need to understand people who are “so different” from you. it’s not going to be a comment regarding your last entry (although as always, I enjoyed what you wrote). But I want to live a link to a TED speech, which I think is in sync with this site. One of the phrases from the speech “When there is curiosity, education happens” 😀 Brilliant! For any Korean learners out there, there’s a Korean translation available. Found through the 교보문고 website.